The Guyana Rice Development Board (GRDB) has allocated 48 quotas to selected rice millers to satisfy the Venezuela market in the lucrative petrol-for-rice deal that Guyana has with that Spanish-speaking nation. Guyana, according to rice officials, was “barely” able to make this year’s contract after some issues arose. However, the deal was signed earlier this year, but with less of the commodity being requested; and with millers offering a low price to farmers for paddy. 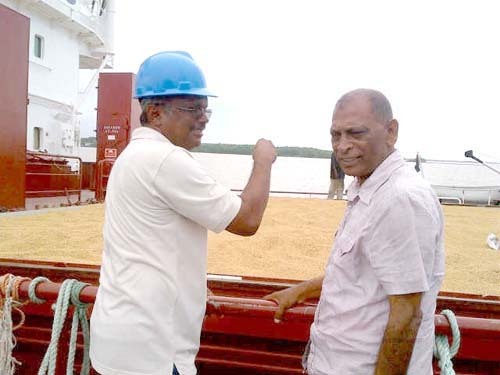 Last week the Guyana Rice Producers’ Association (GRPA) received notification from the GRDB of who would have received quotas for the Spanish port. GRDB General Manager, Jagnarine Singh, had said that the identification of millers for quotas to Venezuela would be based on criteria set by a GRDB team in consultation with the GRPA. Last week he said that that a list of millers was sent to the GRPA’s President, Peter De Groot and the Board was awaiting their response to the matter. However, De Groot said, yesterday, that he was in receipt of the millers list, but that he was not consulted on the matter; neither was his input requested. According to De Groot, the information sent to him was a notification of those chosen for the market. “I was not included in the discussions concerning the allocation of the quotas, but received an explanation as to how these quotas were arrived at. The main criteria used to establish the quota allocation for each mill is explained in detail in the email below from the GRDB Chairman – Mr. Badri Persaud.” De Groot advised millers to make contact if they had any questions. Millers had already expressed concern about how quotas would be distributed. During a meeting at the Agriculture Ministry over two weeks ago, it was stated that the method of quota distribution left room for “dishonest distributions,” since the Board was singlehandedly dealing with the process. De Groot, when asked yesterday, said that the RPA would be unable to say whether the quota distribution was done fairly since the organization is not in receipt of certain information to weigh against the criteria and those awarded. Among the criteria for quotas, was the average paddy amount purchased over the past four years and millers would have had to pay 95 percent of the debt owed to farmers. De Groot said that the body is not in receipt of millers past quotas, so a disgruntled miller would have to come with his information to prove that he met the criteria and was not chosen. De Groot emphasized that he was not involved in the GRDB discussions to award the quotas, but noted that this year’s method of allocation was also used last year. He reminded that without certain information, allocations cannot be challenged. De Groot said that it was only two weeks ago that the RPA was officially registered after becoming more prominent about a year ago. The GRDB was initially an oversight and advisory body to the rice industry, but has taken on the role of negotiating and conducting transactions on behalf of the government. Observers and some operators say that the rice industry is a private sector entity and the government should stay out. Some say too, that the booming industry which seems to have taken over by “PPP cronies and stalwarts, needs no assistance from the government.” They claim that the “middlemen” negotiating for the sector have led to many of the problems now being faced including high operating cost. The rice-for-oil deal was hailed as a blessing for the country, but anger grew over the management of the billion-dollar trade initiative when farmers and millers criticized high operating costs, and middlemen enjoying “sweet heart” brokerage deals. Guyana is expected to surpass a million tons of rice this year, the largest ever production but concerns are high over low markets. Rice producers are selling to their own markets, but some have complained of interference. On the government side, Venezuela is said to be their only market after Panama fell out because their producers were being sidelined for Guyana’s better quality rice. They also owe Guyana three payments out of four 2014 shipments. Middle East and African markets are now being touted by the government.